We visited this Park as a field trip on Sunday and enjoyed a wonderful presentation on research involving Echidnas, Rosenberg’s Goannas and Tiger Snakes: all species studied at a nearby research centre. It has been a conservation park since 1967. Eleven contacts were made from Pelican Lagoon. 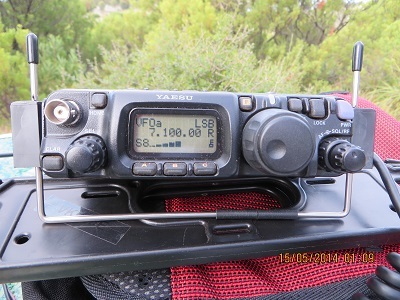 Beginning at 00:28 UTC, VK3UP, Terry; VK5GJ, Greg; VK5LY/P3, Larry in Hattah-Kulkyne National Park; VK5WG, Nev; VK5HS, Ivan; VK3FQSO, Amanda; VK5KGP, Graham; VK5ZGY, Greg; VK5ZAR, Arno; VK5HS/M5, Ivan and VK7VDL, Ron near Dodge’s Ferry. 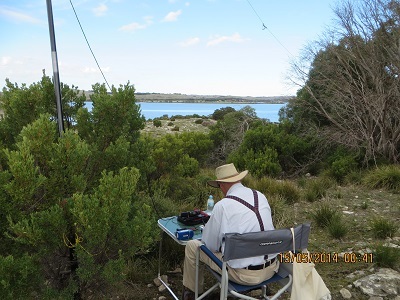 After working 11 stations on 40 metres I changed over to 20m and heard a number of loud stations. I gave a few calls but it was probably too late in the morning, especially for five watts!